Well, not really. I am vegetarian. But I enjoy my certified organic cage-free eggs and organic happy cow milk products. Anything non-dead makes it in my mouth. Except maybe coconut. I hate coconut. Or live animals, for that matter. They may not be dead but that wouldn’t make eating them right so I guess non-dead is not the correct term. Can ya tell I’ve been drinking champagne with a girl friend? Ooooh, ooooh, oooh, I actually won something! Well me and like ten other bolg readers. I was reading the food blog Kaitlin with Honey and she was doing a giveaway of Coach’s Oats. 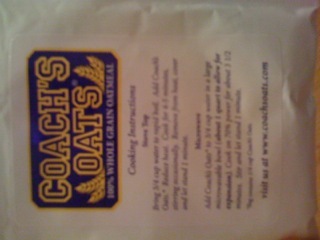 The cool thing about Coach’s Oats is that they are the wonderfully nubbly steel-cut oats, but you can prepare them fast. All you had to do was say how you like your oatmeal in the comments and you were entered. And I did. I like to cook my oats with water, eat them with plain unsweetened almond milk on the side and sometimes sprinkle in Equal. Yes I know. Bad. But as I’ve said at least I stopped with the diet soda. Soooo good. I have a confession: sometimes I really like eating foods that are supposed to be hot, cold. 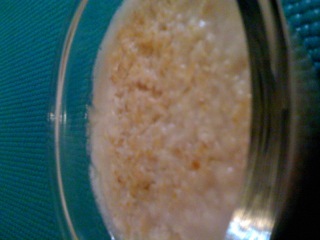 These oats had some time in the fridge. The texture was extra dense and oh so nubbly. I love nubbly-ness. 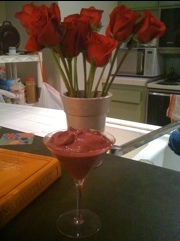 Note the pink martini glass. I purchased it as a graduation present for myself and happily drink everything from shakes to Gatorade to real cocktails from it when I wanna get festive by myself. Also note the flowers. More red roses. I love those. 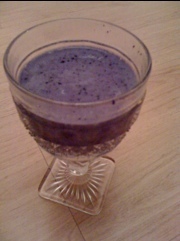 Equal parts frozen fruit(blueberries and cherries are favorites) and vanilla frozen concoction of your choice-ice cream, frozen yogurt, rice cream, they all work. I used an ice milk with a touch of maple in it. 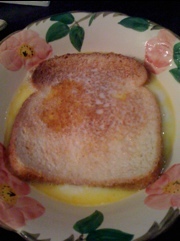 Add some vanilla protein powder if you like and if you like it really sweet like me add more sweetener to taste. Yes I added equal. I know it’s bad but hey, I at least kicked my diet soda habit…Now the shake secret is to also add some extract. Vanilla and almond are equally exceptional. If you have them some vanilla bean is magical. Add enough almond milk to make it as thin or thick as you like. 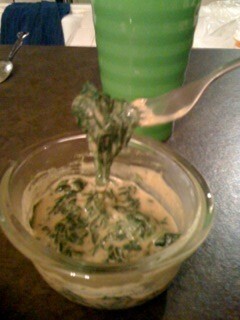 Blend it all up with an immersion blender if you hate washing blender canisters like me and drink that goodness on up.